The necessity for transition in the energy sector is beyond dispute and high on the political agendas. Climate change, the depletion of fossil fuels and the vulnerability of economies to resource speculation and unreliable political systems in the producing countries lay path for a broad implementation of smart alternative solutions. This means the integration of more sustainable renewable energy sources in the existing supply structures or the displacement of existing systems by new ones. Cities and communities are central players in the energy transition process. Energy demand is determined by the built environment. Renewable energy production needs space. The conflicts between different interest groups often break out in the context of local implementation measures that affect urban planning and the appearance of landscapes. How can communities anchor and monitor long-term energy transition visions in their communal development plans? What tools and models are available for urban energy system analysis? How can tools and models be adapted to the specific demands and boundary conditions in the case study communities to ensure long-term implementation of appropriate technologies and measures? How does the practical implementation of the adapted tools work in the case study and what barriers must be overcome for long-term success? To answer these questions a combination of review of the current state of scientific literature of the thematic field with a practical application and evaluation of ‘real’ implementation projects was chosen. This appears to be a beneficial approach to scientific research in planning disciplines. The first research question is closely connected to urban planning and strategy. To anchor energy transition goals in these disciplines the potentials and consequences of political energy visions were studied. To monitor developments and progress existing indicator systems were reviewed and adapted to the needs of small- and medium-sized communities. For this overall target-definition the question of 'Exergy Thinking' in planning urban environments and energy systems was discussed. This basically means to create a deep understanding of the quality aspects in energy demand and supply systems and to be aware for better matching solutions. This approach opens many options for the integration of renewables in the heating and cooling supply. It showed that the definition of a clear long-term target or 'energy vision' supports the implementation of measures because it facilitates communication and controversy. The large number of available tools and scientific methods for the analysis and optimization of communal energy systems was reviewed to answer the second research question. The results from this work mainly led to the one central challenge that has to be solved whenever complex modelling and strategic decision making are affected: Data. Data describes the status-quo and gives necessary information on the complex system interactions and influence factors. The options to create a concise data framework for the central objective were addressed in two steps. From literature, existing models and approaches general data frameworks were collected and summarized. Since the method was to be applied to the test case study the data was validated and tested under the case study conditions. This showed deviations and necessary specifications but as well a good analogy to the default data. From this a transparent and adjustable spreadsheet-model was developed to create scenarios for the case study and to answer the fourth research question. 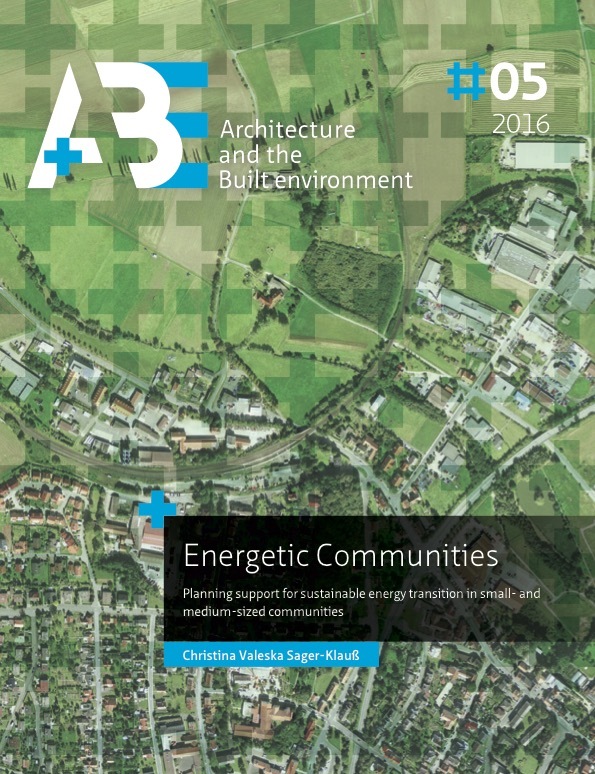 To create a holistic picture of the communal energy system and the effects of increased exploitation of renewables geographic information systems (GIS) show very valuable functionalities. Especially since the processing and interpretation of geographic information is anchored in urban planning disciplines and creates an easy access if energy system information is integrated. The open data architecture of GIS allows the integration of different data types as long as they have a spatial correlation. This enables to retrieve valuable results from a scenario model even with rather fragmented and incomplete data. To show the effects of different implementation strategies represented by the different 'energy visions' three energy scenarios were run for the case study. These three scenarios represent central 'beliefs' or ' approaches' in energy transition as well as overall development indicators and specific local aspects. Therefore the success of energy transition measures remains limited if not all essential development parameters take a favorable course. The scenario evaluation shows some interesting results and shows the principal usability of the approach and the model. The base-case scenario shows that the community already reaches good results for the global energy indicators because of the existing measures. On a medium and long-term these measures are not sufficient though to stay on a good course. Especially the long-term developments in some cases produce unexpected results. For instance the rather unfavourable development of CO2-emissions in the renewable energies scenario was not a predictable result at first glance. Here the effects of the chosen technologies and the effects of superior developments show their impact. As well the huge impact of the assumed efficiency measures was somewhat unexpected. Even though the assumed refurbishment rates do not exceed national recommendations and the efficiency qualities are far from passive-house standard, the efficiency scenario shows the fastest and best results for the global environment indicators. This can be explained by the fact that the demand reduction optimally complements the existing renewable energy strategy and can show its full potential in this combination. The results of the smart-city scenario show the expected and desired trends of a moderate and balanced long-term strategy that leadsto a slower but continuous positive development in all the analysed energy system indicators. The long-term trends of the scenarios and the effects of following ‘plain’ strategies can be visualised well with the model and the developed scheme. Therefore the initial research questions can be answered positively. The framework gives good and useful results and offers many options for future extension. Certainly the next and most important aspect to include into the framework is the question of costs and economic effects. The overall investment and operational costs for the measures in the different scenarios will be very different. Efficiency measures especially in the existing building stock are costly while the costs for PV-plants will most probably further decline. This is certainly a shortcoming for the efficiency scenario. A future study could as well look at overall economic effects of the different strategies for the benefit of the community. Basic figures on the economic effects of renewable energy systems are already available (Hirschl et al. 2010) and could be implemented. This would certainly make the framework more beneficial for communal stakeholders. The model is transparent and simple enough to go this way in the near future and the achieved results of this thesis project are a good basis for this. The realisation of energy systems as sketched in the smart cities scenario still demands some changes in the regulatory boundary conditions and some new technologies mainly in the information and communication technologies. Smart and electricity grid compatible buildings which can contribute services in grid stability are an issue still to come and contribute to the integration of renewable electricity. The integration of renewable heat in communal supply systems is a big future opportunity to realise LowEx potentials in the heating and cooling sector. Stakeholders in small- and medium-sized communities should be encouraged by the outcomes of the thesis to take initial steps on the energy transition path, since the results that can be reached with state-of-the-art technologies are very encouraging. Energy transition on a large scale depends on the local implementation. Despite the fact that public and scientific focus and attention is mostly on the megacities, it will be the countless small initiatives that will turn the tide.